The collection of Islamic seals and talismans of the Ashmolean Museum in Oxford, to which is added one bull, is one of the many collections of gems and related objects to be found in a great number of museums in the world with Islamic holdings. These collections, however, are mostly unknown, and with the exception of the catalogue of seals in the Topkapi Saray Museum in Istanbul , there is no complete catalogue publishing the objects of any one of the other big collections in the world. 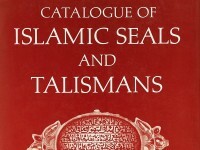 I undertook this descriptive work, which is the basic step for further researchers in the fields of Islamic sealing and of the ‘science' of Islamic talismans, while preparing the publication of the catalogue of Islamic seals, bulls and talismans from the collection of the Cabinet des Médailles of the Bibliothèque Nationale in Paris , and I here now present the catalogue of the collection of the Ashmolean Museum in Oxford. This collection consists of two hundred and twenty-five objects including one hundred and thirty seals, one bull, and ninety-four talismans. According to the data noted on the labels belonging to the objects, the formation of this collection started in the second half of the nineteenth century through purchase and donation, and the collection has continued to expand sporadically ever since. Some of the objects deposited in the museum are on long term loan from Oxford Colleges or from the Bodleian Library . Since the objects catalogued are both numerous and diverse, the collection is of great interest for students in the field of seals and talismans as a whole. Before I present the contents of this collection, I should like to express my thanks to my colleague and friend Dr. James W. Allan, Assistant Keeper in the Ashmolean Museum, who allowed me to study the objects and who facilitated in every way possible my work during my four short stays in Oxford. It was he who undertook all the necessary steps for the publication of this catalogue and it is only owing to his devoted initiative that this catalogue can be published. Many of the gems have been identified by Dr. Brian Atkins of the University Museum in Oxford, to whom I equally give my thanks. For their help with the English translation, I thank Mrs. Guillermina Joël and Mr. Pierre Ennès. Last but not least, I am grateful to my friends Mr. Richard Falkiner and Mr. Thomas Hennich from London, who drew my attention to this collection and who introduced me to the Ashmolean Museum. The photographs were taken by the Photographic Department of the Ashmolean Museum. This publication was prepared according to the research programme of the ‘Unité de Recherches Archéologiques' no. 22 of the French ‘Centre National de la Recherche Scientifique'. Ismail Hakki Uzunçarşili, Topkapi Sarayi Müzesi mühürler seksiyonu rehberi / Guide Book of the Seals of Topkapi Saray Museum, Istanbul, 1959. Ludvik Kalus, Bibliothèque Nationale, Département des Monnaies, Médailles et Antiques: Catalogue des cachets, bulles et talismans islamiques, Paris, Bibliothèque Nationale, 1981. The objects belonging to the various loans are listed in the Concordance of inventory numbers and catalogue numbers, infra, pp.118-120, where the composition of the whole collection can be seen.